From left, Noah Davis, Liz Hadland, her husband Jarrid, their 2-year-old son Stuart, and GSHS mountain bike team coach Randy Tuggle — all stand with the wooden planks that were used to show the basic design and outline of a portion of a proposed BMX course at Veltus Park. All four have taken active roles in either advocating for the new park, which now may involve another town park. Glenwood Springs’ Parks and Recreation Commission believes a bike terrain park would contribute as a valuable asset to the community, just not in Veltus Park. 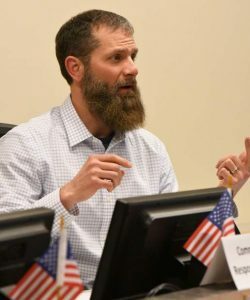 Originally, the discussion pedaled its way before the city parks commission in February when Rick Fout gave a presentation regarding the idea. 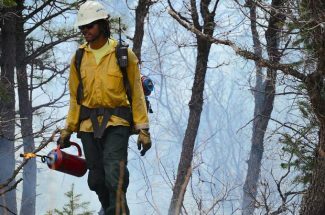 However, the feasibility of it being located in Veltus, located on the Roaring Fork River just upstream from the confluence with the Colorado River, of remained in question. According to City Council liaison to the Parks and Recreation Commission, Steve Davis, the proposed bike park in Veltus actually came to a vote of the advisory panel. 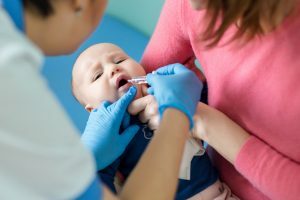 “That doesn’t happen often, on anything,” Davis said at the Thursday City Council meeting in regards to the commission actually making a motion and taking a vote at its May 9 meeting. Other options for a bike terrain park now include Two Rivers Park and the Wulsohn Mountain Park area behind the Glenwood Springs Community Center. 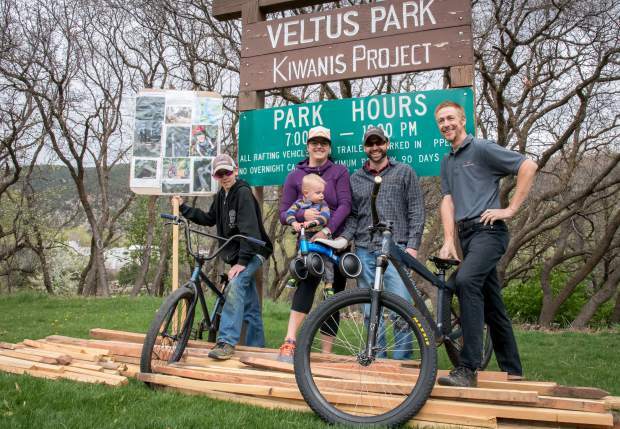 After the concept of a bike park in Veltus, often referred to as Kiwanis Park because of the service club’s many projects there, started gaining traction, it was met with obstacles from opponents, particularly Kiwanis Club members. Councilor Todd Leahy inquired what the Parks and Rec board’s main issues were with Veltus. According to the Glenwood Springs Kiwanis Club’s Facebook Page, the club meets every Tuesday evening from June through October for a barbecue. Bike park project consultant Brian Buell said he wasn’t shocked, and not necessarily disappointed with the Parks and Recreation Commission decision, “as it was kind of community oriented and that’s kind of what this project is,” he said. “There are other user groups that have considerations in terms of what they want the area to be used for, so we want to respect that, especially those that are long-time established within the area … It’s an asset that the public, community members and council have advocated for,” Buell explained. While Veltus may have been the original, desired location for the new bike park, proponents of the project now have their eyes on two other possible locations. “Two Rivers Park is another idea,” Buell said. “There is some space that is being under utilized. That could be a bike improvement there. Another suggested space included the area located behind the Community Center on the Wulfsohn Mountain Park area, where a network of mountain bike trails are located. However, according to Buell, at the moment that parcel would serve as their third or, at least at this time, least desirable option.